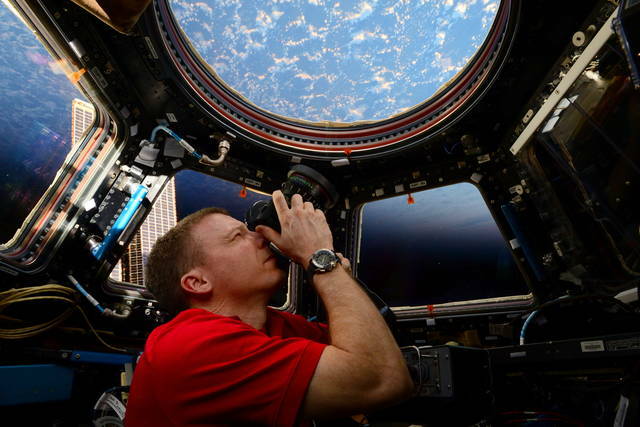 National Geographic Live, National Geographic’s touring speaker series, will present “View from Above” with Terry Virts, a celebrated NASA astronaut and National Geographic author. Virts will share his unique stories and stunning photographs taken from a place many will never visit — space. The McCoy Marquee Series presents National Geographic Live “View From Above” at the Jeanne B. McCoy Community Center for the Arts (100 W. Dublin-Granville Rd., New Albany) on Friday, December 14, at 7 pm. Tickets are $31.50 at the CAPA Ticket Center (39 E. State St.), all Ticketmaster outlets, and www.ticketmaster.com. To purchase tickets by phone, please call (614) 469-0939 or (800) 745-3000. As a NASA astronaut, pilot of the space shuttle Endeavour and crew member on the Russian Soyuz spacecraft, Virts spent 200 consecutive days in space as commander of the International Space Station—one of the longest continuous space mission of any NASA astronaut. More recently, Virts appeared in the 2016 IMAX film A Beautiful Planet, a breathtaking portrait of Earth from space that features stunning footage—much of it shot by Virts while aboard (and outside) the International Space Station—of our magnificent blue planet and humanity’s impact on it. His photography, which provides incredible aerial views of Earth and the vast space that surrounds it, is featured in a new National Geographic book, VIEW FROM ABOVE: An Astronaut Photographs the World, which is available wherever books are sold. National Geographic Live is the live events division of National Geographic. With a broad roster of talent including renowned photographers, scientists, authors, filmmakers and adventurers, National Geographic Live’s critically acclaimed programs have connected with audiences worldwide for over a century. Currently, National Geographic Live events are held in a variety of cities around the world, including, Seattle, Tampa, Los Angeles, Florence, and Calgary. In each of these cities, speakers share behind-the-scenes stories from the front lines of exploration onstage alongside stunning imagery and gripping footage. The 2018-19 Marquee Series at the McCoy Center for the Arts is made possible through the generous support of the New Albany Community Foundation and Lbrands Foundation. National Geographic Partners LLC (NGP), a joint venture between National Geographic and 21st Century Fox, is committed to bringing the world premium science, adventure and exploration content across an unrivaled portfolio of media assets. NGP combines the global National Geographic television channels (National Geographic Channel, Nat Geo WILD, Nat Geo MUNDO, Nat Geo PEOPLE) with National Geographic’s media and consumer-oriented assets, including National Geographic magazines; National Geographic studios; related digital and social media platforms; books; maps; children’s media; and ancillary activities that include travel, global experiences and events, archival sales, licensing and e-commerce businesses. Furthering knowledge and understanding of our world has been the core purpose of National Geographic for 130 years, and now we are committed to going deeper, pushing boundaries, going further for our consumers … and reaching millions of people around the world in 172 countries and 43 languages every month as we do it. NGP returns 27 percent of our proceeds to the nonprofit National Geographic Society to fund work in the areas of science, exploration, conservation and education. For more information visit natgeotv.com or nationalgeographic.com. The Jeanne B. McCoy Community Center for the Arts, Inc. is a 501(c)(3) non-profit corporation, established in 2007 by a unique joint operating agreement between the New Albany Community Foundation, the City of New Albany, Plain Township, and the New Albany Plain Local School District. Since opening in 2008, the McCoy Center has drawn more than 100,000 people, fulfilling its mission of fostering an appreciation of arts and culture by providing life-long learning opportunities through education, exposure, and participation. For more information, visit www.mccoycenter.org. National Geographic and Jason Michael Paul Entertainment, Inc., today announced an all-new tour for National Geographic: Symphony for Our World, which will perform in Columbus on Thursday, March 21, at the Ohio Theatre. Symphony for Our World combines stunning National Geographic natural history footage with an original symphony and theme created by Emmy- and BAFTA-nominated Bleeding Fingers Music. Featuring composers Austin Fray and Andrew Christie, the show brings audiences a breathtaking musical journey coupled with some of the world’s most incredible wildlife spectacles. Tickets go on sale to the general public on November 23 at www.NatGeo-Symphony.com. CAPA presents National Geographic: Symphony for Our World at the Ohio Theatre (39 E. State St.) on Thursday, March 21, at 7:30pm. Tickets are $58.50-$98.50 and can be purchased in person at the CAPA Ticket Center (39 E. State St.), online at www.capa.com, or by phone at (614) 469-0939 or (800) 745-3000. The tour kicks off in March 2019, and beginning today, people can visit www.NatGeo-Symphony.com and register to receive a pre-sale password to buy tickets before the general public. Pre-sale tickets will be available beginning Tuesday, November 13, when passwords will be emailed to all registered customers. Driven by a five-part composition, Symphony for Our World pairs artistry with science as it brings viewers from the depths of the sea, up coastlines, onto land, through mountains, and into the sky. Each environment will be accompanied by a different orchestral movement, resulting in a powerful musical tribute to the beauty and wonders of our wild world. For more information, tour dates and tickets, visit www.natgeo-symphony.com. Additional updates are available on Twitter and Facebook. Owner/operator of downtown Columbus’ magnificent historic theatres (Ohio Theatre, Palace Theatre, Southern Theatre) and manager of the Riffe Center Theatre Complex, Lincoln Theatre, Drexel Theatre, Jeanne B. McCoy Community Center for the Arts (New Albany, OH), and the Shubert Theatre (New Haven, CT), CAPA is a non-profit, award-winning presenter of national and international performing arts and entertainment. For more information, visit www.capa.com. Disclosure statement: The author does not work for, consult, own shares in or receive funding from any company or organization that would benefit from this article. She has received funding for 2017-2019 from the Japan Foundation Center for Global Partnership (CGP) for a research project on emerging frontiers in space. She is Founding Co-Chair of the U.S.-Japan Space Forum, and as an academic member of the Washington State Space Coalition (which merged with AFA) she has been asked to serve on space-related advisory committees for both AFA and PNAA.